ART, RESEARCH, THEORY: In the November column we are pleased to feature Irene Pérez (Spain), a visual artist based in Terrassa (Barcelona). Her work explores identity, language and the physical space. She is also a mother to a vibrant five-year-old girl. Their life together has made Pérez question and further investigate the social constructs of the world around her. From these inquiries Pérez has been inspired to take part in projects such the co-creation of the feminist group Mitja Subversiva (Subversive Knitting), a group of people who meet periodically at the La Caníbal co/op bookstore in Barcelona to discuss socio-political issues and create actions through textile production. From both being an artist and a mother, she has learned to see obstacles in life as stepping-stones for new discoveries. Last summer I attended the The Mothernists conference, a three-day spent with a group of women artists and cultural producers who engage with motherhood and mothering in their practices. Organized by the m/other voices foundation and inspired by artist Lise Haller Baggesen’s project and book, it was a truly stimulating and eye opening experience. So, when at the end of the conference I was invited to write a column for m/other voices I was thrilled and immediately said yes. Almost as immediately, I felt the anxiety that invades you when you feel not fitted for a task you have undertaken. What will I write about? What kind of knowledge could I share? On a greater level, I had had the same feeling when, after twenty-four hours of labor during which both my life and my daughter’s where at risk, I found myself holding a premature tiny baby who looked nothing like I had imagined. Holding her for the first time, two thoughts immediately entered my mind: This new person who came out of my body feels like a stranger; I have no idea what am I supposed to do now. Doubt and uncertainty are part of the equation both in parenting and artistic practice and nobody tells you about them neither in art school nor in the prenatal courses. In both instances, once you know their presence is only temporary, though recurrent, you learn to navigate them and use them to your advantage. It takes an artist to raise a child, dye and resist on silk scarf (30"x30"); Mothernism (2013-ongoing) Lise Haller Baggesen. Photo by Asleigh Dye, courtesy of the artist and Inside\Within. I desperately struggled with motherhood for the first two and a half years. It wasn’t pretty. I despised being a mother almost as much as I profoundly loved my daughter and this was a contradiction that caused me an unbearable pain. Why was I at war with motherhood? It took some time and a lot of searching in books and in conversations with other mothers, but I finally realized that the war was not against my motherhood, but against the social construct of motherhood. All the romanticism embedded in me since I was a little girl and all the impossible things everybody seemed to be expecting of me: the good mother; the multi-task super woman; the endless vessel of love, compassion and attentiveness. My struggle was also due to the fact that my work as a mother seemed to have no value (at least not one that was rewarded with money or recognition). All of a sudden my career was on hold and I was “only” a mother. But, because we live in a world that seems to speak just in economical terms, I was completely missing the mark. It took me a while to understand that I was not the one failing, but that it is the structure (i.e. the socio economical system) supporting this construct that is failing us all. Argentinean artists and mother of three Ana Álvarez-Errecalde recently said in the article Cathartic Power of Art: Motherhood as a Rite of Passage: “As a mother I have experienced the absurdities and unfairness of a society which on the one hand idealizes maternity, but on the other hand belittles and turns its back on the needs and care that arise from the mother-child relationship.” In the same article, Alvarez-Errecalde talks about the socio-economical repercussions of such underestimation of mothering, which does not acknowledge the possibilities and the significance that care labor has in our societies. artist/mother (2011), Irene Pérez. Cross-stitch work. In my motherhood I have gone through doubt, uncertainty and frustration to little by little understand the personal and social relevance of mothering. Most of all, I have come to experience how our social and economical systems devalue the work and the role of care givers, who are usually women. It is especially evident to me that this is the case when we talk about the role that mothers play in education – meaning the transmission of skills and knowledge. When our daughter was four years old and going to a school here in Spain, she started to show worrying signs of anxiety. There were episodes of bullying at school and she felt pressured to do the class work. The place that was supposed to be safe and feed her curiosity was causing her pain and taking away the sparkle in her eye. In a country with growing political corruption and instability, where people are being stripped of their social and civil rights, my daughter showed me the way to understand that education is a key part of a system that prioritizes the production-line mentality over the wellbeing of people. I began looking for an alternative form of education, which took us onto an amazing process of transformation. We are now part of a community, an education co-op, and in the process realized that we, her parents, are her primary educators. Mothering, (2015), Irene Pérez.Work in progress for New Universe, preparation watercolor for textile work. Nowadays, in our three-bedroom apartment a passionate physicist, a tenacious artist, a vibrant five-year-old girl and a loving black cat live together. This makes for a very interesting mix when it comes to the exchange of knowledge. Our life is filled with constant exploration and everyday I have proof that children are born with limitless curiosity and creativity. Nobody needs to teach them that. Furthermore, I have learned the importance of keeping this interaction alive if we truly want the world to be a better place for us all; and I do. Because of my daughter, and through her, I am being exposed to innovative ideas and experiencing the possibility of different paradigms. And it is this place that I am at this moment, where I find myself being my daughter’s teacher as much as learning from her, where the world enters my studio. 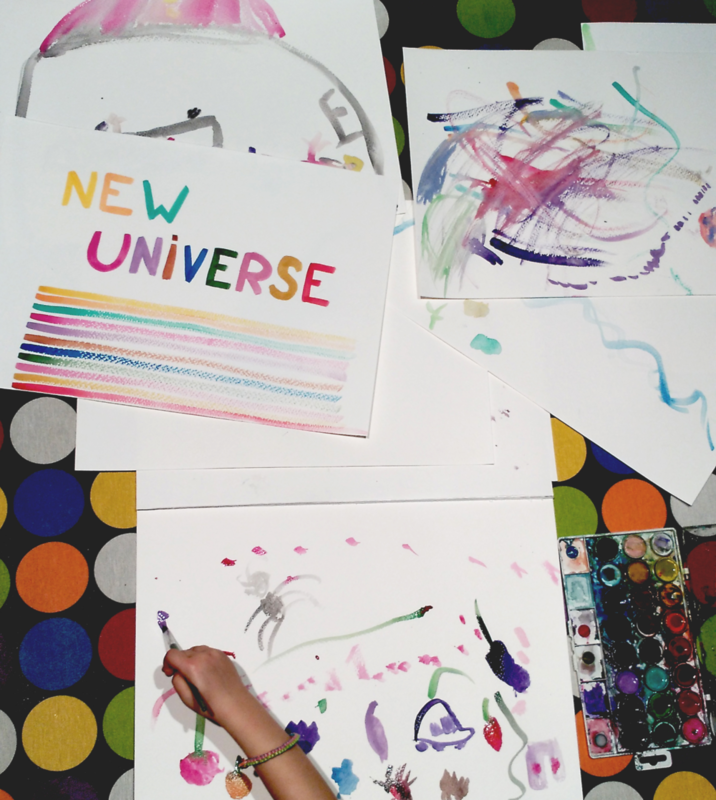 Next year I will have my first solo exhibition at a museum, which, under the title New Universe, will present a series of works that explore the learning processes that occur within the family, especially between mother and child. My goal with these works is to give a voice to the social relevance of mothers, children and the work they do together, because to me it becomes clearer and clearer that our daughter Maia has come to teach me many things. After all her name does mean mother. Artist Irene Pérez and daughter Maia sharing an afternoon of painting and ideas. When making a donation you can choose to make a general donation towards the daily running of the foundations activities or you can choose for your donation to go towards a specific activity. For more information please visit our donations page.